Kaisa Snellman is assistant professor of organizational behavior at INSEAD in Fontainebleau, France. Jennifer M. Silva is assistant professor of sociology at Bucknell University. Robert D. Putnam is the Peter and Isabel Malkin Professor of Public Policy at Harvard University. Research shows that extracurricular activities help cultivate the skills, connections, and knowledge that prepare children for lifelong success, but low-income students are increasingly excluded from participating. Ethan started out in Cub Scouts in kindergarten with five other boys in his neighborhood and achieved the prestigious rank of Eagle Scout by his senior year in high school. His final service project, designed to instill leadership and citizenship, was to build a horse bridge for a farm that offered physical therapy to disabled kids; his uncle, a contractor, helped him with the complex design and arduous construction. When we ask him why he decided to stick with Boy Scouts, Ethan points to his father: “Probably him.” While his dad Blake acknowledges that scouting is “tough” because “kids have a lot more distractions” like television and video games, he tried to make it fun through two-week hiking trips to New Mexico where they tracked bears and practiced navigation. Ethan also played soccer, ran track, and participated in orchestra, his father taking on the responsibility of driving the orchestra bus. Ethan’s mother, who was making chicken and dumplings when we interviewed him for our study, registered him to vote when he turned eighteen; he speaks passionately about a wide range of political issues like gay marriage and environmental protection, drawing on the knowledge he has picked up through a lifetime of family dinners. Much of the current debate about the growing inequality in education outcomes has focused on the widening achievement gap between students from high-income and low-income families. But what happens outside the classroom is equally important to children’s success. Ethan stood out to the admissions committee at his university not only for his high grades and stellar test scores, but also for this sustained engagement in Scouts, his wide range of interests and achievement, and his commitment to civic engagement. Ethan is lucky: with his parents’ flexible work schedules, comfortable financial situation, and commitment to his social and intellectual development, his pathway into a middle-class adult life was almost seamless. But for many other children, the rising costs of sport teams and school clubs, combined with parents’ uncertain work schedules and precarious household budgets, have made extracurricular activities a luxury they can’t afford. Struggling with budget cuts and deficits, many school districts have cut back on their funding for drama clubs and music programs and either reduced the number of afterschool sports offered or put a hefty price tag on participation. The end result is that an increasing number of low-income students find themselves left on the sidelines. While public schools theoretically provide equal access to afterschool activities to all enrolled students, the reality is that access has become increasingly limited to children from middle- and upper-class families. In our recent study, we examined trends in extracurricular participation from the 1970s to today (Snellman et al., forthcoming). Our findings are alarming: while upper-middle-class students have become more active in school clubs and sports teams since the 1970s, working-class students have became increasingly disengaged and disconnected, their participation rates plummeting in the 1990s and remaining low ever since. Ethan is just one of the 120 young adults we interviewed across the country. While his story illustrates the importance of afterschool activities for life success, other interviews shed light on why working-class students have been left behind, both inside and outside the classroom. Nicole, an eighteen-year-old who, like Ethan, lives in Austin, Texas, works in the kitchen at a three-star hotel. In her East Side neighborhood, with its bright flashing lights of police cars on every corner, it was too dangerous to play outside, and many of her afternoons as a child were spent watching TV alone. With both her parents working long hours to keep their family afloat – her father as a garbage collector and her mother as a hotel maid and a waitress – Nicole didn’t have much supervision or guidance after school. She had trouble making friends in ninth grade and started taking pills with the other girls to fit in. Her sophomore year, however, Nicole joined the dance team, where she would perform at football games, and her parents sacrificed a lot to pay the $800 a year it cost to buy her uniform and pay for her travel to competitions. She explains that she got her grades up that year because “you had to pass to compete.” But the $800 proved too much for the family, and she quit the next year. Nicole soon met a boy in the neighborhood, and when her parents would leave for work early in the morning, she would sneak over to his mother’s apartment to see him. Soon, she was pregnant. She moved in with her boyfriend and his mother, going to high school during the day, then running, even eight months pregnant, to catch the bus to get to work at Pizza Hut for minimum wage until midnight. Nicole, who left her boyfriend when he became abusive, wants to give her daughter a better life and recently borrowed nine thousand dollars for a year-long medical billing course at a for-profit college. But for now, simply buying her daughter food, diapers, and clothes at Goodwill leaves her with nothing left over at the end of the month. Nicole’s story attests to the potential rewards of extracurricular activities: her lone year on the dance team prompted her to earn higher grades and trade taking pills for daily dance practice, and perhaps taught her self-discipline, commitment, and teamwork along the way. But it also attests to the greater challenges she faced, compared with Ethan. Compared with their middle-class peers, working-class youth are more likely to grow up in families, schools, and neighborhoods like Nicole’s where violence, drug and alcohol abuse, and early sexual activity are common (see Figure 1). For adolescents like them, extracurricular activities may be particularly helpful in that they offer supervision, guidance, and future directedness. But for many families, participation fees required upfront at the beginning of each season simply prove to be too costly. With schools struggling to fund activities inside the classrooms – teachers, books, supplies – should we really care about what happens to debate clubs and tennis teams? Research suggests that we should. 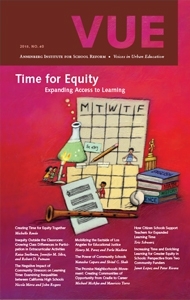 A growing body of research demonstrates that participating in organized activities outside the classroom helps cultivate the skills, habits, connections, and knowledge that prepare children for lifelong success: academic success in school, graduating from high school, going to college, getting a job, and participating in civic life. This is the very logic that fueled the High School Movement, a period of educational reform in the early 1900s that aimed to cultivate skills such as leadership, hard work, civic mindedness, and self-discipline across the class spectrum (Mondale & Patton 2002). Even after controlling for family background and cognitive ability, involvement in extracurricular activities predicts higher grades; higher college aspirations, enrollment, and completion; greater self-discipline, self-esteem, and resilience; lower risky behavior such as drug use, delinquency, and sexual activity; and lower truancy rates (Zaff et al. 2003). Furthermore, the effects of extracurricular activities appear to extend well beyond college: students who are involved in clubs and sports go on to earn higher wages, advance further in their careers, and even vote and volunteer more frequently than their less-involved peers. There is also evidence that students who hold leadership positions in high school are able to command higher salaries later in life (Kuhn & Weinberger 2005). Middle-class parents know this and groom their children from an early age to excel in competitive afterschool activities like soccer, chess, and dance (Levey Friedman 2013). If we could predict the future, we would not be surprised to see Ethan land a competitive professional job out of college, advance to a high-paying managerial position, and spend his leisure time volunteering in his local community. For Ethan, hiking trips with his Boy Scouts team taught him more than navigation: they taught him perseverance, teamwork, and resilience in the face of adversity. In building the horse bridge for the farm for disabled kids, he also learned to think creatively and to see a goal through to the end despite the lure of video games and television. These “soft skills” – working with others, leadership, grit, self-discipline, and endurance – are cultivated through participation in extracurricular activities. Scholars have found that these noncognitive traits are at least as important as cognitive abilities in predicting educational attainment and income ten years down the road, even after taking into account family background. Today’s employers look for workers who arrive on time, complete their assigned tasks, work well with others, and show initiative – all traits that Ethan learned simply through Boy Scouts. Psychologists Claire Robertson-Kraft and Angela Duckworth (2014) studied the effects of extracurricular activities on career success. They collected resumes of novice teachers in low-income schools and rated them based on passion and perseverance in college activities. The teachers with highest “grit” scores – those who had been team captains or presidents of clubs – turned out to be the best teachers and stayed in their jobs longer. By contrast, other seemingly important characteristics such as SAT scores and college GPAs turned out to be poor predictors of teachers’ retention or effectiveness. Clearly, extracurricular activities instill the skills and values that matter most for upward mobility. Extracurricular activities also help build important connections to mentors such as soccer coaches, bandleaders, and youth group pastors, who can be paramount in a young person’s life. Take the example of Carlos, an eighteen-year-old high school senior we met at a community center in Southern California. By middle school, Carlos had already been pulled into a gang in his neighborhood. He was inspired, however, by a woman in the neighborhood who was going to college classes, working, and raising three children; she caught his attention one day when she loudly mocked the clothes the gang members were wearing. After becoming friends with this young woman, Carlos decided to leave the gang and do better in school. When he failed classes, he repeated them in the summer. He also started taking mixed martial arts lessons as an outlet for his anger – while he resisted the lessons for a while because he couldn’t get a signature from his dad promising to pay the fees (he didn’t even ask, knowing it was too expensive), the coach told him that he could wash his car in exchange for lessons. Carlos’s love of martial arts led him to the school wrestling team, where he is one of the top competitors – he has even begun to hope to wrestle in college. Studies of mentoring programs like Big Brothers/Big Sisters and Philadelphia Futures Sponsor-A-Scholar have shown that these programs have broad positive social and academic impacts on adolescents like Carlos. The Big Brothers/Big Sisters program pairs unrelated adult volunteers with youth from single-parent households for the purpose of providing youth with an adult friend. Economists Jean Baldwin Grossman and Joseph Tierney (1998) studied the effects of the Big Brothers/Big Sisters program through a comparative study of 959 ten- to sixteen-year-olds who applied to the program in 1992 and 1993. Half of the children were randomly assigned to a treatment group, who all were matched with an adult mentor. The other half were assigned to a waiting list. After eighteen months, both groups were interviewed. The results were nothing but encouraging: the students who had been assigned a mentor were less likely to have initiated drug or alcohol use, to hit someone, to skip class or a day of school, or to lie to their parents; they also had higher average grades and were more likely to feel competent in their school work and to report a better relationship with their parents. We can see the positive effects of informal mentoring in Carlos’s story, as the generosity of his wrestling coach and the positive influence of an adult in the neighborhood inspired him to leave the local gang, focus on wrestling instead of drugs and crime, and even aspire to college. Carlos, unfortunately, is the exception to the rule: many working-class and poor students who need mentors the most don’t have them. The 2011 National Survey of Children’s Health asked children from middle school through high school about important adult mentors in their lives. Almost one in five low-income children reported not having any mentoring relationships through school, neighborhood, or community. In contrast, only five percent of middle-class children reported not having any important adult connections outside their immediate family. Furthermore, while Carlos found mentors in his neighbor and his martial arts coach and a possible pathway to serious competitive sports, he faced obstacles that the more-affluent Ethan did not. In the Scouts and in the private housing development, Ethan was in a safe environment surrounded by a range of caring adults who likely mentored him about both college and career. Financial advantage, physical safety, and the social capital that comes from mentors and adult role models gave Ethan critical supports that were far less available to Carlos. What explains these growing class gaps in the extracurricular involvement? Given the importance of extracurricular participation to children’s future success, it is truly alarming that we see working-class kids increasingly excluded from after-school activities and disconnected from caring adults. Why are working-class students absent from the very activities that would help them climb the economic ladder? Nicole’s story offers insights into the tumultuous worlds of working-class students. Like many public schools, Nicole’s high school is facing pressure to tighten its budget, raise test scores, and focus on academic “core competencies.” This leaves no room in the budget for seemingly frivolous extras like dance team, so the cost of participation has shifted from the community (through taxes) to the individual parents. While affluent and poor school districts alike have felt this pressure to trim their budgets, they have responded in markedly different ways. Poorer school districts often simply cut their extracurricular offerings. As researchers Elizabeth Stearns and Elizabeth J. Glennie (2010) found in their study of North Carolina public high schools, the percentage of students receiving free or reduced-price lunch in the overall student body is negatively associated with the total number of extracurricular activities, sports teams, and service opportunities offered by the school. Affluent parents, on the other hand, have the means to subsidize school activities through private resources, whether fundraising to send the school orchestra to Japan or simply writing a yearly check. But of most concern is the shift toward “pay to play,” which puts more and more of the burden of participation on families whose budgets may already be strained. Many schools are implementing athletic participation fees to cover the cost of school sports. For example, the Arlington school district in Massachusetts charges $500 to join the football team and $480 to wrestle. To play on the tennis team in the Riverside Local school district in Ohio costs students $874. Other school districts have introduced fixed fees for all athletics: the Westerville school district in Ohio charges $240 for every sport and $50 for choir, marching band, and the theater club. There are no national data that track trends in pay-to-play programs. However, according to a recent survey by the University of Michigan C. S. Mott Children’s Hospital (2012), 61 percent of middle and high school students nationwide were charged a pay-to-play fee. While the average fee was $93, 21 percent of parents were charged a participation fee of $150 or more – and these numbers do not include the cost of equipment, uniforms, and additional fees like travel, which raise the average cost to $381. These fees disproportionately disadvantage children from families who earn less than $60,000 per year, as 19 percent of these parents reported that their children’s participation dropped because of the cost. On the other end of the spectrum, among families earning more than $60,000 per year, only 5 percent reported lower participation due to increased costs. The rise of pay-to-play policies and elimination of academic clubs and sports teams are seemingly natural responses to tightening budgets. When schools are furloughing teachers, laying off custodians, and postponing classroom renovations, it may seem frivolous to continue funding chess clubs and cheerleading teams. For some, it may seem fair that students who want to participate should pay for the activities. But the rising financial barriers to participation have serious consequences, especially for those who need them the most. Extracurricular activities help students like Nicole to keep her grades up; resist the pull of drugs and risky behaviors; and find inspiration and connection in the face of dangerous neighborhoods, financially strapped parents, and besieged schools. As Ethan prepares to graduate from college and pursue a lucrative career in engineering, Nicole is struggling to raise a child on minimum wage. The diverging destinies of these two American young adults serve as a cautionary tale of what happens when we disinvest in children’s futures (Silva 2013). Cutting extracurricular activities from the school budget or attaching a hefty price sticker to them not only puts low-income students at a greater disadvantage, but it also robs all of us of the potential contributions that the Nicoles of the world could have made. 1. Students’ names in this article are pseudonyms. C. S. Mott Children’s Hospital. 2012. “Pay-to-Play Keeping Lower-Income Kids out of the Game,” C.S. Mott Children’s Hospital National Poll on Children’s Health 15, no. 3. Grossman, J. B., and J.P. Tierney. 1998. “Does Mentoring Work? An Impact Study of the Big Brothers Big Sisters Program,” Evaluation Review 22, no. 3:402–425. Kuhn, P., and C. Weinberger. 2005. “Leadership Skills and Wages,” Journal of Labor Economics 23, no. 3:395–436. Levey Friedman, H. 2013. Playing to Win: Raising Children in a Competitive Culture. Berkeley, CA: University of California Press. Mondale, S., and S. B. Patton. 2002. School: The Story of American Public Education. Boston: Beacon Press. Robertson-Kraft, C., and A. L. Duckworth. 2014. “True Grit: Trait-Level Perseverance and Passion for Long-Term Goals Predicts Effectiveness and Retention among Novice Teachers,” Teachers College Record 116, no. 3:1–27. Silva, J. M. 2013. Coming Up Short: Working-Class Adulthood in an Age of Uncertainty. New York: Oxford University Press. Snellman, K., J. M. Silva, C. B. Frederick, and R. D. Putnam (forthcoming). 2015. “The Engagement Gap: Social Mobility and Extracurricular Participation among American Youth,” The ANNALS of the American Academy of Political and Social Science (January). Stearns, E., and E. J. Glennie. 2010. “Opportunities to Participate: Extracurricular Activities’ Distribution across and Academic Correlates in High Schools,” Social Science Research 39, no. 2:296–309. Zaff, J. F., K. A. Moore, A. Romano Pappillo, and S. Williams. 2003. “Implications of Extracurricular Activity Participation during Adolescence on Positive Outcomes,” Journal of Adolescent Research 18: 599–630.